*Aimone, Duke of Spoleto accepted nomination on 18 May 1941, abdicated 31 July 1943 and renounced all claims on 12 October 1943. Subsequently, the state was no longer a technical monarchy. Ante Pavelić became head of state, and his title as leader of the ruling Ustaše movement, "Poglavnik", officially became the title of the NDH head of state. The Independent State of Croatia (Croatian : Nezavisna Država Hrvatska, NDH; German : Unabhängiger Staat Kroatien; Italian : Stato Indipendente di Croazia) was a World War II fascist puppet state of Germany    and Italy. It was established in parts of occupied Yugoslavia on 10 April 1941, after the invasion by the Axis powers. 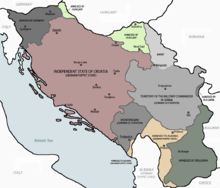 Its territory consisted of most of modern-day Croatia and Bosnia and Herzegovina, as well as some parts of modern-day Serbia and Slovenia, but also excluded many Croat-populated areas in Dalmatia (until late 1943), Istria, and Međimurje regions (which today are part of Croatia). Poglavnik was the title used by Ante Pavelić, leader of World War II Croatian movement Ustaše and of the Independent State of Croatia between 1941 and 1945. The Jastrebarsko concentration camp held Serb children who had been brought there from various areas of the Axis puppet state, the Independent State of Croatia during World War II. It was established by the Ustaše-led government, and was located in the town of Jastrebarsko, about 37 kilometres (23 mi) southwest of the NDH capital, Zagreb, operating from 12 July until October 1942. Camp administration was provided by nuns of the Daughters of Charity of Saint Vincent de Paul order, with Ustaše guards. Sisak children's concentration camp officially called "Shelter for Children Refugees" was a concentration camp during World War II located in Sisak, set up by the Ustaše government of the Nazi-puppet state, the Independent State of Croatia, for Serbian, Jewish and Romani children. It was part of the Jasenovac extermination camp. 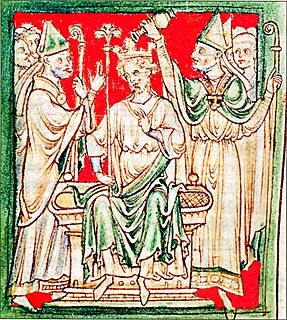 The Crown of Zvonimir was bestowed on King Dmitar Zvonimir of Croatia in 1076 by the papal legate. Zvonimir ruled Croatia until 1089 after which the crown was used in the coronation of his successor Stjepan II and presumably by the numerous Hungarian monarchs after the unification of the Kingdom of Croatia and Kingdom of Hungary in 1102. Victor Emmanuel III was the King of Italy from 29 July 1900 until his abdication on 9 May 1946. In addition, he held the thrones of Ethiopia and Albania as Emperor of Ethiopia (1936–1941) and King of the Albanians (1939–1943). During his reign of nearly 46 years, which began after the assassination of his father Umberto I, the Kingdom of Italy became involved in two world wars. His reign also encompassed the birth, rise, and fall of Italian Fascism. 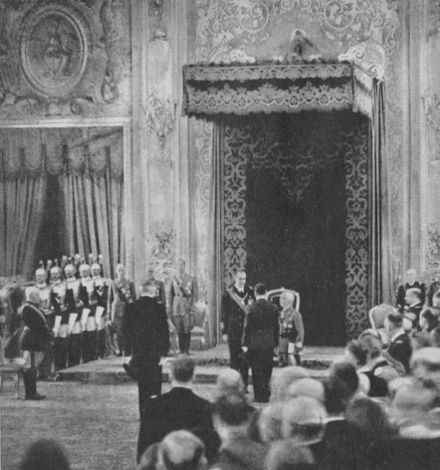 The Treaties of Rome were a set of three international treaties signed on 18 May 1941 by the Independent State of Croatia and Kingdom of Italy at the Palazzo Venezia in Rome. 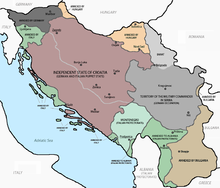 The most important provisions in the treaties referred to the borders between the two states, as they allowed the creation of the Italian Governorate of Dalmatia, carved out of the occupied Yugoslav territory following the April 1941 invasion of Yugoslavia. In international law, a condominium is a political territory in or over which multiple sovereign powers formally agree to share equal dominium and exercise their rights jointly, without dividing it into "national" zones. 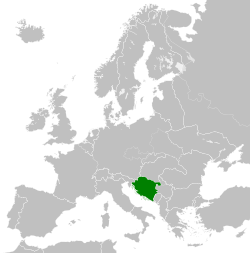 The exact borders of the Independent State of Croatia were unclear when it was established. Approximately one month after its formation, significant areas of Croat-populated territory were ceded to its Axis allies, the Kingdoms of Hungary and Italy. When compared to the republican borders established in the SFR Yugoslavia after the war, the NDH encompassed the whole of Bosnia and Herzegovina, with its non-Croat (Serb and Bosniak) majority, as well as some 20 km2 of Slovenian (villages Slovenska vas near Bregana, Nova vas near Mokrice, Jesenice in Dolenjsko, Obrežje and Čedem)  and the whole of Syrmia (part of which was previously in the Danube Banovina). The Nazi regime demanded that the Ustaše adopt antisemitic racial policies, persecute Jews and set up several concentration camps. Pavelic and the Ustaše accepted Nazi demands, but their racial policy focused primarily on eliminating the Serb population. When the Ustaše needed more recruits to help exterminate the Serbs, and the state broke away from Nazi antisemitic policy by promising honorary Aryan citizenship, and thus freedom from persecution, to Jews who were willing to fight for the NDH. As this was the only legal means allowing Jews to escape persecution, a number of Jews joined the NDH's armed forces. This aggravated the German SS, which claimed that the NDH let 5,000 Jews survive via service in the NDH's armed forces. German soldiers who died on Croatian territory were not commemorated until Germany and Croatia reached an agreement on marking their grave sites in 1996. The German War Graves Commission maintains two large cemeteries, in Zagreb and Split. The absolute leader of the NDH was Ante Pavelić, who was known by his Ustaše title, Poglavnik , throughout the war, regardless of his official government post. From 1941 to 1943, while the country was a de jure monarchy, Pavelić was its powerful Prime Minister (or "President of the Government"). 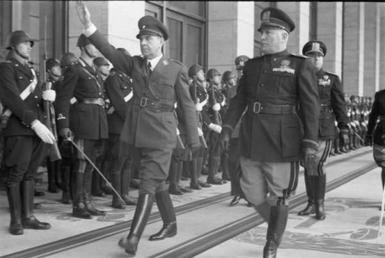 After the capitulation of Italy, Pavelić became the head of state in the place of Aimone, Duke of Aosta (also known as Tomislav II) and retained the position of Prime Minister until early 1944, when he appointed Nikola Mandić to replace him. The Army was originally limited to 16 infantry battalions and 2 cavalry squadrons – 16,000 men in total. The original 16 battalions were soon enlarged to 15 infantry regiments of two battalions each between May and June 1941, organised into five divisional commands, some 55,000 men. Support units included 35 light tanks supplied by Italy,  10 artillery battalions (equipped with captured Royal Yugoslav Army weapons of Czech origin), a cavalry regiment in Zagreb and an independent cavalry battalion at Sarajevo. Two independent motorised infantry battalions were based at Zagreb and Sarajevo respectively. Under the terms of the Treaties of Rome (1941) with Italy, the NDH navy was restricted to a few coastal and patrol craft, which mostly patrolled inland waterways. Because of low morale among army conscripts and their increasing disaffection with the Ustaša regime as the war progressed, the Partisans came to regard them as a key element in their supply line. According to William Deakin, who led one of the British missions to the Partisan commander-in-chief Josip Broz Tito, in some areas, Partisans would release army soldiers after disarming them, so they could come back into the field with replacement weapons, which would again be seized. Other army soldiers either defected or actively channelled supplies to the Partisans—particularly after the NDH ceded Dalmatia to Italy. Army troop numbers dwindled from 130,000 in early 1943 to 70,000 by late 1944, at which point the NDH government amalgamated the army with the Ustaše army and was organised into eighteen divisions, including artillery and armoured units. Despite these difficulties, the army, along with the German-commanded XV Cossack Corps, was able to assist the Wehrmacht to hold its lines in Syrmia, Slavonia and Bosnia against the combined Soviet, Bulgarian and Partisan offensives from late 1944 to shortly before the NDH collapse in May 1945. An estimated 320,000–340,000 Serbs, 30,000 Croatian Jews and 30,000 Roma were killed during the NDH, including between 77,000–99,000 Serbs, Bosniaks, Croats, Jews and Roma killed in the Jasenovac concentration camp   and the same number of Serbs were forced out of the NDH. The existing University of Zagreb was renamed the Croatian University (Serbo-Croatian : Hrvatsko sveučilište), and was the only university in the NDH. The university established a pharmaceutical faculty in 1942,  and a medical faculty in Sarajevo in 1944. It also opened the University Hospital Zagreb, which later became one of the largest hospitals in Croatia. The state film institute, Hrvatski slikopis, produced many films, including Straža na Drini and Lisinski . The Croatian cinema pioneer Oktavijan Miletić, was active during this period. In 1943, Zagreb hosted the I. International Congress for Narrow Film. The state's main radio station was Hrvatski Krugoval, known before the war as Radio Zagreb. The NDH increased the transmitter's power to 10 kW. The radio station was based in Zagreb, but had branches in Banja Luka, Dubrovnik, Osijek and Sarajevo. It maintained cooperation with the International Broadcasting Union. ↑ " Poglavnik " was a term coined by the Ustaše, and it was originally used as the title for the leader of the movement. In 1941 it was institutionalized in the NDH as the title of first the Prime Minister (1941–43), and then the head of state (1943–45). It was at all times held by Ante Pavelić (1889 – 1959) and became synonymous with him. The translation of the term varies. The root of the word is the Croatian word "glava", meaning "head" ("Po-glav(a)-nik"). The more literal translation is "head-man", while "leader" captures more of the meaning of the term (in relation to the German " Führer " and Italian " Duce "). Sekula Drljević was a Montenegrin lawyer and separatist politician who collaborated with the Italian military occupation authorities in Montenegro during World War II. Rafael Ranko Boban was a Croatian military commander who served in the Ustaše Militia and Croatian Armed Forces during World War II. Having participated in the Velebit uprising in 1932, he joined the Royal Italian Army and returned to Croatia following the Axis invasion of Yugoslavia in April 1941. He fought with the Ustaše until the end of the war, when he is reported to have evaded the Yugoslav Partisans and reached the Austrian town of Bleiburg. Nothing is known of what happened to him afterwards, and it was rumoured that he was either killed in Podravina in 1945, died fighting with the Crusaders in Herzegovina in 1947, or, less likely, emigrated to the United States via Argentina, joined the United States Army and fought Communist forces in the Korean War. In 1951, he was named the Croatian Minister of Defence in-exile by Ustaše leader Ante Pavelić. Jezdimir Dangić was a Bosnian Serb Chetnik commander during World War II. Born in the town of Bratunac, he was imprisoned during World War I for his membership of the revolutionary movement Young Bosnia. He subsequently completed a law degree and became an officer in the gendarmerie of the Kingdom of Serbs, Croats and Slovenes at the beginning of 1928. In 1940 he was appointed to lead the gendarmerie detachment stationed at the Yugoslav royal palace. 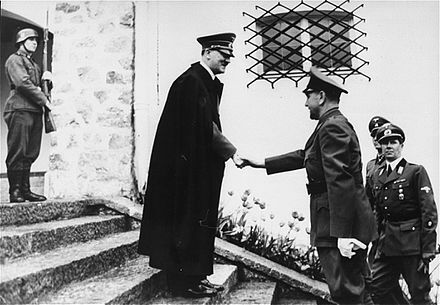 With the Axis invasion of Yugoslavia in 1941, Dangić commanded the gendarmerie unit that escorted King Peter II out of the country. In August of that year, Colonel Draža Mihailović appointed him commander of the Chetnik forces in eastern Bosnia. Here, Dangić and his men launched several attacks against the forces of the Independent State of Croatia (NDH). In August, Dangić's Chetniks captured the town of Srebrenica. Afterwards, they became largely inactive in fighting the Germans, choosing instead to avoid confrontation. In December, Chetniks under Dangić's command massacred hundreds of Bosnian Muslims in the town of Goražde. In December, his Chetniks captured five nuns and took them with them through Romanija to Goražde, where they later committed suicide to avoid being raped. Dobroslav Jevđević was a Bosnian Serb politician and self-appointed Chetnik commander in the Herzegovina region of the Axis-occupied Kingdom of Yugoslavia during World War II. He was a member of the interwar Chetnik Association and the Organisation of Yugoslav Nationalists, a Yugoslav National Party member of the National Assembly, and a leader of the opposition to King Alexander between 1929 and 1934. The following year, he became the propaganda chief for the Yugoslav government. Operation Alfa was an offensive carried out in early October 1942 by Italian, Croatian and Chetnik forces against the communist-led Partisans in the Prozor region, then a part of the Croatian puppet state, the Independent State of Croatia (NDH). The operation was militarily inconclusive, and in the aftermath, Chetnik forces conducted mass killings of civilians in the area. Mladen Lorković was a Croatian politician and lawyer who became a senior member of the Ustaše and served as the Foreign Minister and Minister of Interior of the Independent State of Croatia (NDH) during World War II. Lorković led the Lorković-Vokić plot, an attempt to establish a coalition government between the Ustaše and the Croatian Peasant Party and align the Independent State of Croatia with the Allies. Stjepan "Stijepo" Perić was a Croatian politician, diplomat and member of the Ustaše. After the creation of the Independent State of Croatia in April 1941, he served as ambassador to Italy and to Bulgaria, and then as Foreign Minister. He was forced to resign from his ministerial post in April 1944 after a string of incidents in which his attitude and behavior irritated senior Axis leaders, including Hitler and Mussolini. Petar Baćović was a Bosnian Serb reserve army officer, lawyer, and then a Chetnik commander within occupied Yugoslavia during World War II. From the summer of 1941 until April 1942, he headed the cabinet of the Ministry of Internal Affairs for Milan Nedić's puppet Government of National Salvation in Belgrade. In July 1942, Baćović was appointed by the Chetnik leader Draža Mihailović and his Supreme Command as the commander of the "Chetnik Operational Units in eastern Bosnia and Herzegovina" during which he collaborated with the Italians and Germans in actions against the Yugoslav Partisans. 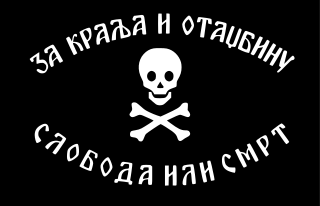 The Dinara Division was a Chetnik division that existed during World War II. Organized in 1942 with assistance from Ilija Trifunović-Birčanin and headed by Momčilo Đujić, the division incorporated commanders in Bosnia and Herzegovina, northern Dalmatia, and the Lika region with the intent of establishing a purely Serb state cleansed of other nationalities. The division was under the control of supreme Chetnik commander Draža Mihailović and received aid from Dimitrije Ljotić, leader of the Serbian Volunteer Corps, and Milan Nedić, head of the Serbian puppet Government of National Salvation. Husein "Huska" Miljković was a Bosnian Muslim military commander who fought with various military formations in Yugoslavia during World War II. A communist politician during the interwar period, he joined the Yugoslav Partisans following the Axis invasion of Yugoslavia but defected to the Ustaše in mid-1941. He defected back to the Partisans in December 1941 and was made leader of communist forces in northwestern Bosnia during 1942. Following a political disagreement, he defected to the Ustaše yet again in February 1943 and was given command of 100 soldiers. He formed his own 3,000-strong Bosnian Muslim militia with the help of the Germans and Croats in late 1943. He agreed to align himself with the Partisans once again in early 1944, prompting Muslim anti-communists within his militia to assassinate him in May 1944. Stevo Rađenović was a Yugoslav Radical Union politician during the interwar period and a Chetnik leader in the Lika region of the Axis puppet state, the Independent State of Croatia during World War II. He was a prominent leader of the July 1941 Srb uprising against the genocidal Ustaše-led NDH government, and was the first Chetnik leader in the region to reach an understanding with the Royal Italian Army in order to collaborate with them against the Yugoslav Partisans. ↑ Massock, Richard G. (1 March 2007). "Italy from Within". Read Books. Retrieved 2 September 2017– via Google Books. ↑ "Croatia" Archived 1 November 2009 at WebCite . Microsoft Encarta Online Encyclopedia; retrieved 8 September 2009. ↑ Pavlowitch, Stevan K. (2 September 2017). "Hitler's New Disorder: The Second World War in Yugoslavia". Columbia University Press. Retrieved 2 September 2017– via Google Books. 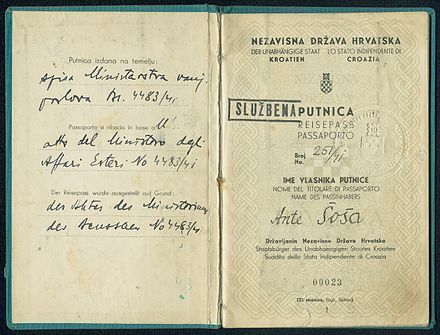 1 2 "Gospodarstvo Nezavisne Države Hrvatske 1941–1945. (1)" [Business of the Independent State of Croatia] (in Croatian). Archived from the original on 16 April 2014. Retrieved 15 April 2014. ↑ Pusić, Eugen. Hrvatska središnja državna uprava i usporedni upravni sustavi. Školska knjiga, Zagreb (1997), pg. 173. ↑ Tomasevich, Jozo. War and Revolution in Yugoslavia 1941–1945. pp. 381–82. ↑ "Duke gives up puppet throne". St. Petersburg Times . 21 August 1943. p. 10. ↑ "Foreign News: Hotel Balkania". Time Magazine . 9 August 1943. Retrieved 4 December 2009. ↑ "Royal House of Italy". European royal houses . Archived from the original on 15 April 2008. ↑ Davor KovaĀiþ. "KAZNENO ZAKONODAVSTVO I SUSTAV KAZNIONICA I ODGOJNIH ZAVODA U NEZAVISNOJ DRŽAVI HRVATSKOJ". Hrcak.srce.hr. Retrieved 2 September 2017. ↑ "Organization of the Croatian State Railways". Hrcak.srce.hr. Retrieved 3 June 2011. 1 2 "Map of the zone" (GIF). Terkepek.adatbank.transindex.ro (in Hungarian). Retrieved 2 September 2017. 1 2 Mario Kevo. "Posjet poslanika Međunarodnog odbora Crvenog križa logorima Jasenovac i Stara Gradiška u ljeto 1944". Hrcak.srce.hr. Retrieved 2 September 2017. ↑ Goldstein, Ivo. "Jews in Yugoslavia 1918–41: Antisemitism and the Struggle for Equality" (PDF). Central European University . Retrieved 7 February 2010. ↑ "Filmological Research in the Vienna Film Archive 2004". Hrcak.srce.hr. Retrieved 3 June 2011. ↑ "Matica hrvatska – Dom, krv, tlo". Web.archive.org. 27 September 2007. Archived from the original on 27 September 2007. Retrieved 2 September 2017. ↑ "Projekt Marijana Haberlea za Provincijalat franjevaca konventualaca u Sisku iz 1943. godine". Hrcak.srce.hr. Retrieved 3 June 2011. ↑ "History of Handball". Hrs.hr. Archived from the original on 6 January 2016. Retrieved 3 June 2011. Wikimedia Commons has media related to Independent State of Croatia . g Kosovo is the subject of a territorial dispute between the Republic of Kosovo and the Republic of Serbia. The Republic of Kosovo unilaterally declared independence on 17 February 2008, but Serbia continues to claim it as part of its own sovereign territory. The two governments began to normalise relations in 2013, as part of the Brussels Agreement. Kosovo has been recognized as an independent state by 113 out of 193 United Nations member states, 10 of which have been subsequently withdrawn.